Gordon is confident he will reach a long-term agreement with the Chargers, but first he wants to see the contract Le'Veon Bell ends up signing, Gilbert Manzano of The Orange County Register reports. Gordon rushed nine times for 15 yards and a touchdown while catching one of two targets for 11 yards in Sunday's 41-28 divisional-round loss to New England. Gordon (knee) practiced in full Friday and doesn't have a designation for Sunday's divisional-round game at New England, Sam Fortier of The Athletic reports. Analysis: Gordon picked up a minor injury to his left knee during the Chargers' wild-card win in Baltimore but built up his practice reps from none Wednesday to all of them Friday, clearing him to suit up for this weekend's showdown. Considering he's been banged-up for a good portion of the season, he likely is in line for a similar workload from the past three games -- 15.3 touches per game -- while working in a timeshare with Austin Ekeler. Gordon (knee) returned to a limited practice Thursday. Analysis: Gordon sat out Wednesday's practice, but his return to the field Thursday puts him on the right track in advance of Sunday's playoff game against the Patriots. We'll circle back Friday to see if the Chargers list their top running back as questionable for the contest or remove Gordon altogether from the team's final injury report of the week. Gordon (knee) won't practice Wednesday, Eric D. Williams of ESPN.com reports. Gordon is dealing with a minor left knee sprain but isn't believed to be at any risk of missing Sunday's divisional-round matchup with the Patriots, Ian Rapoport of NFL Network reports. 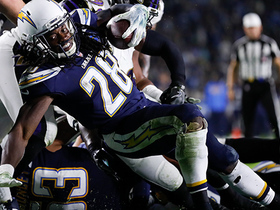 Gordon rushed 17 times for 40 yards and a touchdown and secured his only target for three yards in the Chargers' 23-17 wild-card win over the Ravens on Sunday. Gordon, who was forced out of Sunday's wild-card game against the Ravens with a left knee injury, was able to return to the contest. 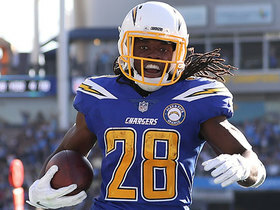 Analysis: Great news for the Chargers, who held a 6-0 lead in the contest upon Gordon's return to action in the second quarter. Austin Ekeler remains on hand to spell Gordon and work in a complementary role out of the Chargers' backfield Sunday. Gordon was forced out of Sunday's wild-card game against the Ravens with a knee injury, Eric D. Williams of ESPN.com reports. Analysis: After hurting his knee, Gordon headed to the locker room to be evaluated. Prior to his exit from the game, the running back ran three times for eight yards. Next up for the Chargers' carries in Gordon's absence is Austin Ekeler. Gordon (ankle) practiced in full Wednesday. Gordon, who suffered an ankle injury in the fourth quarter of Sunday's 23-9 win over the Broncos, is expected to play in the Chargers' wild-card matchup with the Ravens during the upcoming weekend, a source told Adam Schefter of ESPN. Gordon said he "tweaked" his ankle during Sunday's 23-9 win at Denver but expects to be OK for the Chargers' wild-card contest at Baltimore next weekend, Eric D. Williams of ESPN.com reports. Gordon (knee) carried the ball 12 times for 41 yards and a touchdown, while also catching all three of his targets for 13 yards in the 22-10 loss to the Ravens on Saturday. Gordon (knee) does not carry an injury designation for Saturday night's game against the Ravens, Ricky Henne of the Chargers' official site reports. Gordon (knee) is expected to suit up Saturday night against Baltimore, Adam Schefter of ESPN reports. Analysis: This report is hardly out of the box, as Gordon logged a full practice Tuesday where he was described as "full speed," effectively shedding his injury tag. Whether or not he returns to his prior workload immediately is another question, though the rest of the backfield behind him isn't at 100 percent, with Austin Ekeler (neck) missing back-to-back practices this week. Gordon (knee) was a full practice participant Tuesday. Coach Anthony Lynn said Gordon (knee) was "full speed" at Tuesday's practice, Eric D. Williams of ESPN.com reports. Analysis: Whether that translates to full participation remains to be seen, but the description of Gordon lines up with Williams' own report from earlier Tuesday, when the running back was "moving well." Because Austin Ekeler (head/neck) remains in the concussion protocol, the Chargers backfield seems to be trending toward Gordon in the lead role, with Justin Jackson and Detrez Newsome available for the occasional touch Saturday against the Ravens. 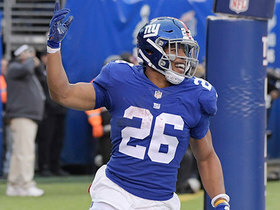 Gordon (knee) took part in practice again Tuesday and looked good while doing so, Eric D. Williams of ESPN.com reports. Coach Anthony Lynn said Gordon (knee) will practice in a limited fashion Monday, Eric D. Williams of ESPN.com reports. The Chargers anticipate Gordon (knee) will be ready to play Week 16 against the Ravens, Ian Rapoport of NFL Network reports. Gordon (knee) is officially inactive for Thursday night's game against the Chiefs. Analysis: With Austin Ekeler (neck/concussion) also out, Justin Jackson is in line to head the Chargers' Week 15 backfield, with Detrez Newsome and Troymaine Pope available to work in complementary/reserve duties. Gordon (knee) will not play Thursday against the Chiefs, Adam Schefter of ESPN reports. Analysis: Gordon's status for Week 15 still has not been officially revealed, but this report provides even more proof that he will not return to action Thursday night. With Austin Ekeler (neck/concussion) already ruled out, Justin Jackson is in line to start at running back for the Chargers. Gordon (knee) appears likely to sit out Thursday night's game against the Chiefs, Omar Ruiz of NFL Network reports. Analysis: We'll get confirmation of such an outcome, either way, upon the release of the Chargers' inactives in advance of Thursday's 8:20 ET kickoff. If Gordon is made inactive, Justin Jackson would head the team's Week 15 running attack, given that Austin Ekeler (neck/concussion) is out. When asked by Omar Ruiz of NFL Network if he was going to play Thursday against the Chiefs, Gordon (knee) "shook his head sideways, indicating a no." 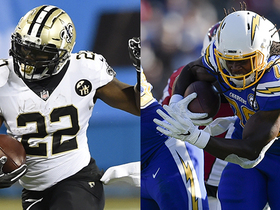 Analysis: Gordon's status for Thursday's contest will not be official until the Chargers' inactives are released, and there is certainly still a chance he could play, but given that he himself answered the question in regards to his availability, the arrow for him playing is pointing down. Gordon's status will be revealed shortly before 6:00 PM (ET), but the early indication is it will be Justin Jackson starting at running back for the Chargers on Thursday night. According to Adam Schefter of ESPN, "it will be challenging" for Gordon (knee) to suit up Thursday night at Kansas City. Gordon (knee) is listed as questionable for Thursday's game against the Chiefs. Gordon (knee) was a limited participant in Tuesday's practice. The Chargers aren't optimistic that Gordon (knee) will be available for Thursday's game against the Chiefs, coach Anthony Lynn told Steve Wyche of NFL Network. Gordon (knee) was listed as a non-participant on Monday's practice report. Analysis: Monday's status stands as an estimation given that the Chargers simply went through a walk-through. Gordon has a chance to return Thursday after missing the past two contests, which would come at an opportune time considering backup Austin Ekeler remains in concussion protocol. Rookie Justin Jackson will handle first-team reps until either Gordon or Ekeler return to practice. Gordon (knee) is listed as out for Sunday's game against the Bengals but could be ready to play in the Chargers' Thursday night game in Kansas City in Week 15, Ian Rapoport of NFL Network reports. Gordon (knee) has been ruled out for Sunday's game against Cincinnati, Eric D. Williams of ESPN.com reports. Analysis: Gordon hasn't practiced since suffering an MCL sprain Nov. 25 and likely faces an uphill battle to make it back for a Thursday night game against the Chiefs in Week 15. As for the immediate future, Gordon's absence leaves Austin Ekeler and Justin Jackson to split the backfield work against a Bengals defense ranked 24th in yards per carry (4.9) and dead last in rushing yards allowed (153.3 per game) this season. Gordon (knee) isn't practicing Friday, Eric D. Williams of ESPN.com reports. Analysis: After another week without any practice activity, Gordon should be officially ruled out for Sunday's game against the Bengals when the Chargers release their final Week 14 injury report later Friday. Gordon's expected absence leaves Austin Ekeler and Justin Jackson to man the backfield. Gordon (knee) was a non-participant in Thursday's practice, Sam Fortier of The Athletic reports. Analysis: With no activity in back-to-back practices to kick off Week 14, Gordon's chances of returning from a one-game absence don't appear promising. Before officially ruling on his status, the Chargers will wait and see what Gordon is able to do in their final practice of the week Friday, but there hasn't been much indication that the running back has made much noteworthy progress. Austin Ekeler and Justin Jackson look poised to head the Los Angeles backfield again this weekend against the Bengals. Gordon (knee) didn't practice Wednesday. 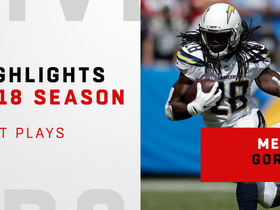 Analysis: Per Eric D. Williams of ESPN.com, coach Anthony Lynn indicated that as the week rolls along, Gordon's ability to change directions and protect himself in team drills will be important factors in the Chargers' decision regarding the running back's availability for Sunday's game against the Bengals. Should Gordon miss a second straight contest, Austin Ekeler and Justin Jackson would be in store for another week of sharing the backfield snaps. 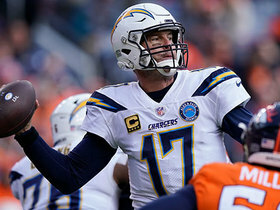 The Chargers are hopeful Gordon (knee) will be ready to play as soon as Week 14 against the Bengals or in Week 15 at Kansas City, Adam Schefter of ESPN.com reports. "It won't be long now," a source told Schefter, regarding Gordon's return. Gordon (knee) is listed as out for Sunday's game against the Steelers, Eric D. Williams of ESPN.com reports. Gordon (knee) didn't participate in Thursday's practice. Gordon (knee) will be evaluated on a week-to-week basis after Monday's MRI confirmed his initial diagnosis of an MCL sprain. Gordon (knee) was diagnosed with a Grade 2 MCL sprain following Sunday's 45-10 win over the Cardinals and is expected to miss multiple games, Ian Rapoport of NFL Network reports. Gordon (knee) received an initial diagnosis of an MCL injury, threatening his availability for Week 13 against the Steelers, Eric D. Williams of ESPN.com reports. Gordon was forced out of Sunday's game against the Cardinals with a right knee injury, Eric D. Williams of ESPN.com reports. Analysis: Prior to his exit, Gordon had logged 10 carries for 61 yards with two TDs and caught two passes for five yards. Next up for the team's carries Sunday are Austin Ekeler and Justin Jackson. Gordon (knee) is active for Sunday's game against the Cardinals. Gordon (knee/hamstring) is listed as questionable but plans to play Sunday against the Cardinals, despite some organizational interest in resting him for maintenance purposes, Adam Schefter of ESPN reports. Gordon (knee/hamstring) will likely will be a game-time decision for Sunday's 4:05 ET contest against the Cardinals, Eric D. Williams of ESPN.com reports. Gordon (hamstring/knee) is listed as questionable for Sunday's game against the Cardinals. Analysis: Gordon's status will thus need to be tracked as Sunday's 4:05 ET kickoff approaches. If he's limited or out Sunday, Austin Ekeler would be next in line for carries, with Justin Jackson in reserve. Gordon (hamstring/knee) was listed as limited on Thursday's practice report. Analysis: Gordon practiced fully Wednesday, so his addition to the injury report Thursday is notable. We'll revisit his status no later than Friday to see if he approaches Sunday's game against the Cardinals with an injury designation or is cleared to play this weekend. Meanwhile, fellow running Austin Ekeler (neck) -- who was limited Wednesday -- returned to a full practice session Thursday. Gordon carried 18 times for 69 yards and added six catches for an additional 87 yards during Sunday's 23-22 loss to the Broncos. Analysis: Gordon tied his second-highest number of carries in any game this season, but he managed just 3.8 yards per tote. He offset that lack of efficiency on the ground with another excellent day catching the ball out of the backfield, including a 32-yard long gain. Gordon has now topped 100 scrimmage yards in six straight games and has at least four catches in four of those. He'll look to continue his outstanding run of form next Sunday against the Cardinals. Gordon rushed 18 times for 93 yards and caught five of six targets for 72 yards and a touchdown in Sunday's 20-6 win over the Raiders. 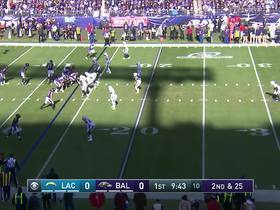 Analysis: Gordon caught a pass in the flat, broke a tackle and took it 66 yards to the house to give the Chargers a two-touchdown lead early in the second half. He fell just seven yards short of his third straight 100-yard rushing game but more than made up for it with his second-best receiving game of the year. The 25-year-old has 100 yards or a touchdown in all seven games he's played in this season and will look to keep the streak going at home Week 11 against Denver. Gordon carried the ball 16 times for 113 yards and a touchdown, and also caught one of his four targets for 10 yards in the 25-17 win over the Seahawks on Sunday. Gordon (hamstring) is active for Sunday's game against the Seahawks. Gordon (hamstring), who is listed as questionable for Sunday's game against the Seahawks, will be available to play, Adam Schefter of ESPN reports. The Chargers are listing Gordon (hamstring) as questionable for Sunday's game against the Seahawks, Ricky Henne of the team's official site reports. Gordon (hamstring) remained limited at practice Thursday. Analysis: Back-to-back practices, albeit in a limited fashion, put Gordon on the right track as Sunday's game against the Seahawks approaches. 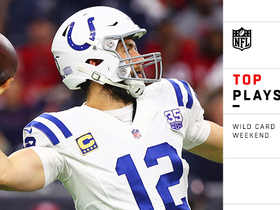 We'll revisit his status no later than Friday afternoon, upon the release of the team's final Week 9 injury report. Ideally, he'll approach the weekend minus an injury designation, given that the Chargers are kicking off at 4:05 ET on Sunday. 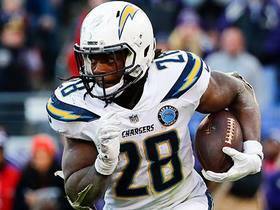 Los Angeles Chargers running back Melvin Gordon joins the "NFL GameDay Pick'Em" crew to pick his winner for Super Bowl LIII. 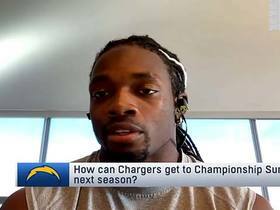 NFL Network's Kay Adams and Peter Schrager explain why Los Angeles Chargers running back Melvin Gordon is the the player to watch in the divisional round. 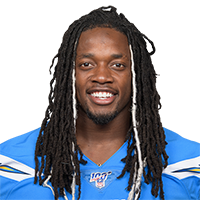 NFL Network's Ian Rapoport reports that Los Angeles Chargers running back Melvin Gordon is expected to play Saturday after being out for three weeks due to an injury.